We will develop our business to a higher level and contribute to the creation of a sustainable society as a driving force in communities and daily life. 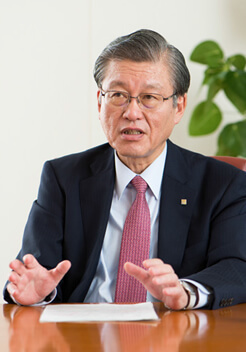 The business environment surrounding the Tokyo Gas Group is changing dramatically, including the deregulations in energy markets, a decline in the number of households, progress in reducing carbon footprints and saving energy, and digitalization. Committed to advancing Group management, we accurately respond to those changes while also continuing to expand the foundation for the future, based on our brand values of “Safety, Security, and Reliability,” so that the Group can progress rapidly in the 2020s. For over 130 years since the Tokyo Gas Group was established in 1885, we have been contributing to society by providing a stable supply of city gas to support the economic development of the Tokyo metropolitan area and enrich daily life. It has consistently sought to enhance its corporate value as an “energy frontier corporate group” by being the first in Japan to introduce and propagate the use of liquefied natural gas (LNG), install large-scale combined heat and power (CHP) systems, and promote the development and wider use of residential fuel cells. In April 2017, following the deregulation of the electricity market, the gas retail market was fully liberalized, which transformed the business environment at an unprecedented scale. As the energy industry faces a major turning point, we formulated the Tokyo Gas FY2018–2020 Medium-term management plan GPS 2020 in October 2017 while anticipating the coming of an era of natural gas, of single-source providers of electricity and gas, and of multidimensional innovation fueled by rapid digital evolution. We will pursue our GPS × G concept, delivering Gas, Power, and Services that meet a variety of needs to Global customers. Our corporate mission is to meet public demand and expectations, which become more substantial every year and are changing at an accelerating pace. The Tokyo Gas Group engages in CSR activities under a basic policy of steadfastly tackling the challenges faced by society through our business activities in order to contribute to the sustainable development of society. In March 2016, Tokyo Gas became a signatory of the UN Global Compact so that it could pursue CSR as a responsible member of the international community, and we support and practice the 10 principles in the four fields of human rights, labor, environment, and anti-corruption. With respect to the Sustainable Development Goals (SDGs) adopted by the United Nations, we have sought to align the common issues and goals of the international community with the social responsibilities of the Tokyo Gas Group to continue developing our CSR management toward achieving the SDGs. The Tokyo Gas Group seeks to develop a sustainable society by actively pursuing initiatives that pay due consideration for the environment and promote smart networks. We are particularly aware of our significant potential for contributing to a low-carbon society. Natural gas, which constitutes the core of our business, is an energy source that generates the lowest CO2 emissions among fossil fuels and is expected to continue playing a key role in addressing climate change. We are increasing investments in renewable energy-based power generation, such as solar and wind power, and in future technologies. We are also constructing smart energy networks that generate and consume energy locally by linking heat, electricity and information networks toward making communities more energy efficient, environmentally friendly and resilient to disasters. In addition, we will continue to develop technologies to ensure the safety and security of people in their daily lives and all of society far into the future while harnessing IoT and AI to meet social needs. As a Tokyo 2020 Games Official Partner in the Gas and Gas Utility Services category, we will contribute to the success of this event as well as creating attractive urban communities by supplying energy to the Tokyo metropolitan area. We view the Tokyo 2020 Games as an opportunity to create an inclusive society based on mutual respect for one another that offers safe, vibrant and pleasant lifestyles for everyone. We will promote initiatives for realizing this vision while also ensuring that they are maintained as consistent and sustainable initiatives that will continue after the Tokyo 2020 Games. Our corporate message of “Supporting you Always and bettering every day” expresses our aspiration to become a driving force behind daily life and society by meeting challenges and taking actions to bring about a vibrant, safe and pleasant future. To consistently fulfill this responsibility in an ever-changing society, we will address social needs and expectations from a global perspective and contribute to the creation of a sustainable society.